There are different problems that can happen during the course of maintaining your saltwater aquarium. Some of it can be quite easy to deal with while others may require constant attention and thus cannot be solved in just a matter of days. Quite a number of problems can be very persistent but as long as you put in enough effort combined with your knowledge and experience to focus on it, nothing is impossible. This article is meant to share some of the common saltwater aquarium issues and how you can effectively deal with it applying good maintenance approach, whereby most important of all is to avoid recurrence. Hopefully this serves as a troubleshooting guide both for novices and experts alike. Algae growth in the aquarium is usually attributed caused by exposure to excessive light, availability of nutrients and with the desirable temperature to encourage its growth. Among the 3 factors, usually prolonged and unnecessary exposure of light is the main reason that promotes algae bloom and in order to deal with the problem, the on-off light cycle of your tank should be controlled with a timer in order not to exceed 8 hours per day. Certain types of lighting like actinic lights which is specifically use to promote growth of corals and invertebrates will further aggravate the situation that causes algae bloom and thus, the only approach is to cut down the length of time in the blue light and instead prolong the white daylight lamp duration. For example, one of the standard time ratio that aquarist often use is the 1.5 hour of actinic to 6.5 hours of white light and if found that algae growth still remains a problem, then a sensible approach is to increase white daylight duration to 7 hours and decrease actinic to 1 hour. Sometimes a change of time duration can make a lot of difference so experiment with it. Phosphate is not only present in the tap water but is also found in the marine salts that we add in during the water preparation, whereby it is a fact that excessive amount over 0.1ppm can have quite a detrimental to the overall health of the aquarium as this will create unsightly growth of algae and stunt the growth of corals. 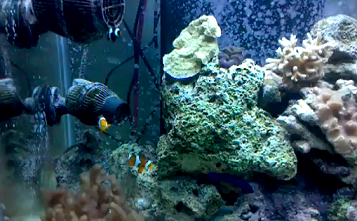 Sometimes you might not even aware that certain types of live rocks that you add to the tank might also be slowly leaching phosphate and other minerals to the water and if this happens whereby you detect high levels of these minerals which are way above the normal concentration, then it is time to remove the objects added earlier to the tank. Using RO water is the best approach to deal with phosphate problem coming from the water source as basically the reserve osmosis process has already removed most of the minerals. However, having said that, if you intend to use it long term, be prepared to deal with the cost of maintaining constant RO water supply. Saltwater condition with lower temperature control setting in the range of 75 - 77 deg Fahrenheit is also found to avoid sudden algae bloom. Higher temperature is known to increase the algae growth rate and this is usually attributed to poor ventilation under the aquarium hood and whatever heat coming from the lighting will get trapped inside the whole fixture. Although it makes sensible approach to improve ventilation, in certain warmer climate regions especially in tropical countries, getting higher than normal water temperature is sometimes almost unavoidable. Thus in order to deal with this maintenance problem, consideration has to be given to install an aquarium chiller equipped with a temperature regulator to control to the desired range. A note of caution though as temperature should not be left to drop too low or else it might have negative effects towards certain types of aquarium fish and corals. A good filtration system will ensure that a balanced natural ecosystem exists in the tank with the waste generation and the takeoff rate remains in total equilibrium. There are at least 8 different approaches to achieve this. Live rocks and sand play an important role in the reef system as it hosts bacteria that consume and breakdown the organic waste to simpler molecular compounds that are non-toxic in nature. Thus, you will need them at all cost. A refugium provides a safe haven for the growth of copepods and amphipods and other macro algae to thrive away from the attention of the predatory fish and thus able to maintain a healthy growing population that helps to biodegrade all the harmful waste materials. A saltwater aquarium that has a refugium functioning as a support system is usually more sustainable compared to those which doesn’t have. Ultraviolet sterilizers are mainly used to kill harmful disease causing bacteria and pathogens and apart from that it can also function as a control unit to contain and prevent algae bloom which can pollute the water. Powerful fish filters usually the external installed type can be used to filter out the junk and returned clean water back to the aquarium. Careful selection of the right unit determines how successful your fish keeping venture will turn out. And finally, nothing beats the constant changing to fresh new saltwater supply and in order to simplify the task and at the same time keep the water clean, an automated top-up water system can be used to maintain and change the water at certain reset interval.